​with much joy and happiness. In this Christmas Special #3, we present: a Carnival of Christmas Past, Christmas Present(s) and Christmas Future. “Hurry into Woolworths and do your Christmas shopping” urged the ad. This amazing old Christmas Cracker feature for a Woolworths store was in an Australian newspaper, “The Sydney Sun”, in December 1924. 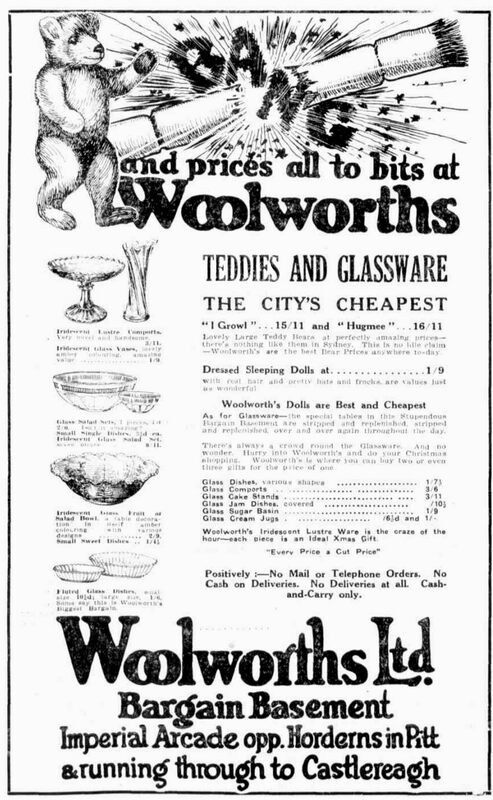 Combining “Teddies and Glassware” was an unusual marketing ploy, but it clearly worked. The teddy bears were said to be “the best Bear Prices anywhere today”! And look at the glass. Not just any glass, this was Carnival Glass from Crown Crystal, made in Australia. The print is small in the ad, but we can see a Carnival (“Iridescent Lustre”) vase and compote at the top and a bowl half way down. ​The bowl is described as “a table decoration in itself”, showing that its beauty was fully appreciated. The exterior design is shown and appears to be the “Fern and Wattle” pattern. ​The ad says that the bowls had “various designs” on the interior, which could have been the Kangaroo (as above), or others such as Kingfisher, Shrike and so on. 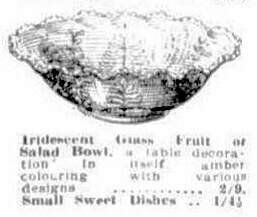 The customer could also buy "Small Sweet Dishes" which were priced at exactly half the cost of the large bowls. ​Crown Crystal's Kangaroo bowl would have made someone an ideal Christmas gift! Or instead, how about other Christmas presents? Gifts for all, free Carnival Glass presents for the ladies. These “free presents” were described as "Beautiful Art Glassware" and they were advertised in the “Duluth Evening Herald” in 1909. Click the ad above to see the full advert. It seems strange to us today to see that the ad - for the Grand Opening of Panton & White's "Glass Block Store" - on a Wednesday was strictly for "Adults Only". The children had to wait until the following Saturday before they would be welcomed into the store. Would such a marketing device work today? The beautiful art glassware on offer was in fact Carnival Glass - from both Northwood and Fenton. Among the pieces offered was Northwood's splendid Blossomtime compote like the ones shown here. ​And we must not forget Santa, of course … as he brings us all those wonderful Carnival Christmas presents! Santa figurine also made by Fenton. Images are courtesy of Seeck Auctions and Wroda Auctions respectively. And finally, what of Christmas future … Christmas yet to come? In 1909, at the time when Carnival Glass was first being made, an astonishing article (extracts below) featured in several USA newspapers. It predicted how life would be at Christmas in 2009. Some prophecies were amazingly accurate, but others were way out. ​It was believed that “there will not be a wheeled vehicle of any kind on the streets” in 2009 – instead the writer said that automobiles, trams and trains would be gone, and all remaining heavy traffic would be subterranean. Furthermore, it predicted that people would live in buildings half a mile high and would fly everywhere. The illustration below shows how they believed people would routinely visit family and friends, residing 245 stories high … in a kind of gondola airship that they called an “aerocab”! That’s an astonishingly far-sighted prediction made in 1909. Does it sound like the internet to you? Ordering your Christmas gifts online perhaps? A notion called a “telautoscope” was described, that would enable people to see who they were speaking to on the phone, or to “connect to any theatre you desire, and you can see the play projected on the wall like the most perfect moving picture”. So, what is the “Christmas Future” for Carnival Glass? Personally, we think that the “telautoscope” is the way forward, in its more familiar form of the world wide web and Facebook in particular. Instead of just a few being able to see and chat about Carnival in one physical location (as in the past) there are multiple thousands of people all over the world with the ability to learn and share together. We invite you and your friends to join us all on NetworK's fast growing and very active Facebook Group (the link is below). If you have missed any of the issues of NetworK and NetworK Specials, they are all here: NetworK Back Issues.